Today I'm posting a recipe for the Golden Girl Granola Blogger Recipe Challenge. 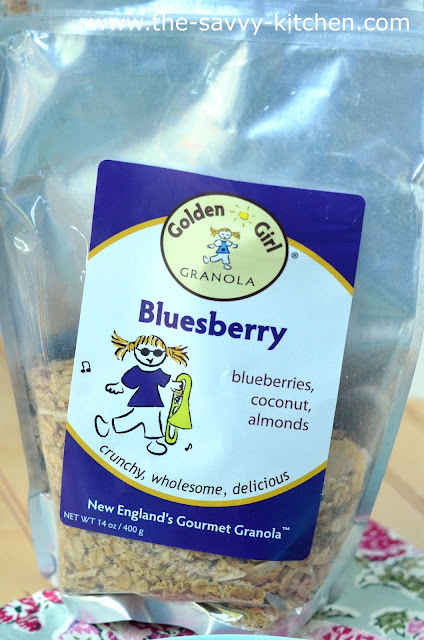 Golden Girl Granola sent me a free sample of their Bluesberry Granola to try out in a new recipe. The only kick was…the recipe had to be an entree! I mean normally I have granola with milk or sprinkled on yogurt, so coming up with an entree recipe was a challenge. But a challenge I was up for! 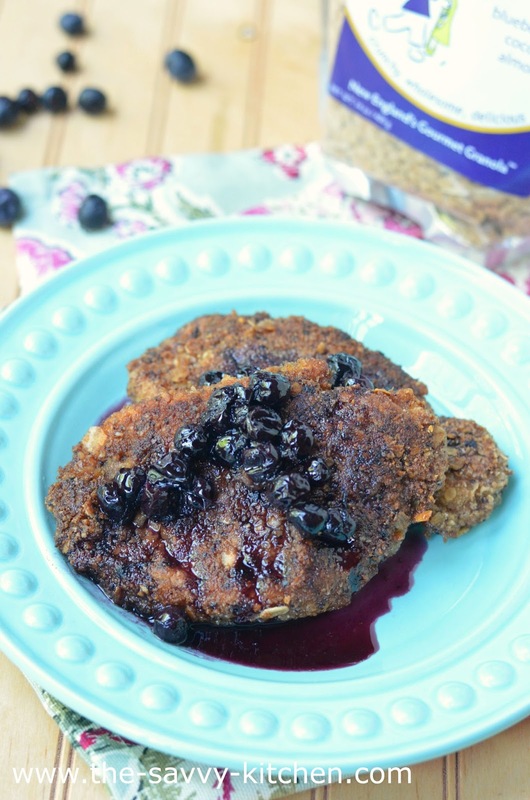 I think that blueberry and pork pair extremely well together, so I used my normal Pork Cutlet recipe and replaced the breadcrumbs with ground up blueberry granola. Then I topped it with a sweet and savory blueberry sauce that complemented the pork and granola coating perfectly. The result was a perfectly moist and slightly sweet version of my favorite pork recipe. Enjoy! For the pork: Preheat oven to 400 degrees F.
Add granola to a food processor or blender. Pulse until granola turns in to crumbs. Pour into a shallow plate and set aside. In a shallow plate, mix flour, 1/2 tsp. salt and 1/2 tsp. pepper. In separate plate, whisk eggs. Dip each cutlet in flour, then egg mixture, then granola crumbs, allowing excess to drip off in between each plate. Keep warm in a 200 degree F oven. 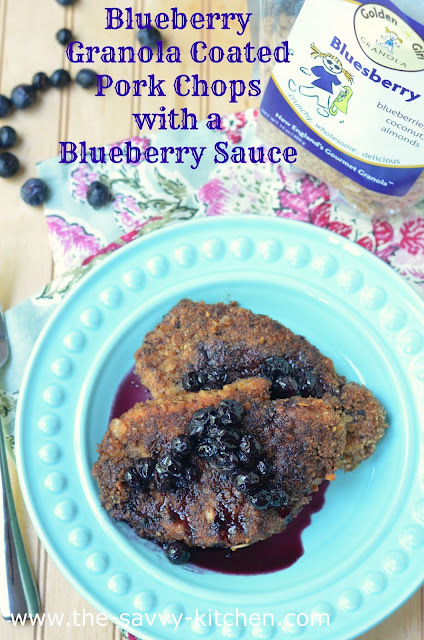 For the sauce: Add blueberries, water, brown sugar and balsamic vinegar to a small pan. Bring to a boil then reduce heat to a simmer. Continue to cook until reduced by half, stirring often. Top pork chops with blueberry sauce. Hey all! Sorry for being M.I.A. the past few weeks. We closed on our new house this past Friday (yay!) so we've been busy with that, packing and trying to get our current house ready for its new owner. We also find out the gender of our new baby this Thursday (double YAY!) so I just haven't had too much time to focus on the blog. But don't worry, I'll be back soon! That being said, it was nice to get back onto the blog and post a new recipe for today! I didn't want to pass up my SRC post, and the Happy Go Lucky blog had a perfect recipe for me to make. It only required three ingredients and I could whip it up for a quick snack for Bradley and me. 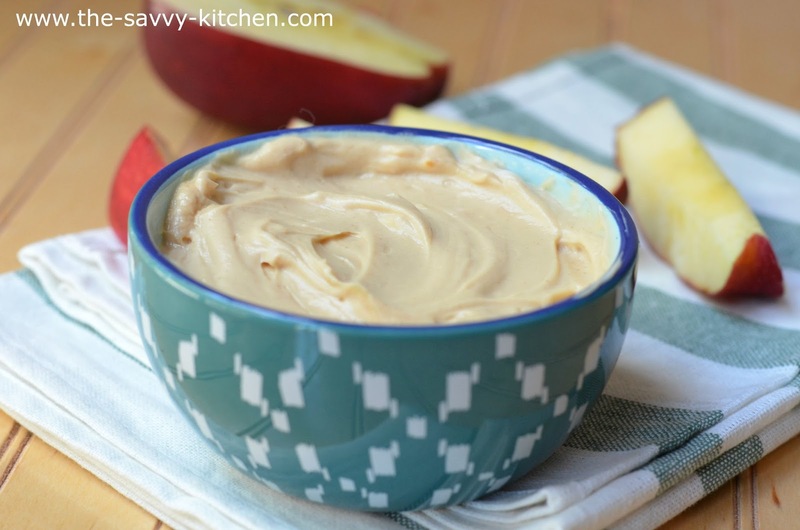 We are both obsessed with fruit these days (he's all about strawberries, blueberries and grapes, while I've been obsessing over mangoes), and all types are a perfect accompaniment to this dip. 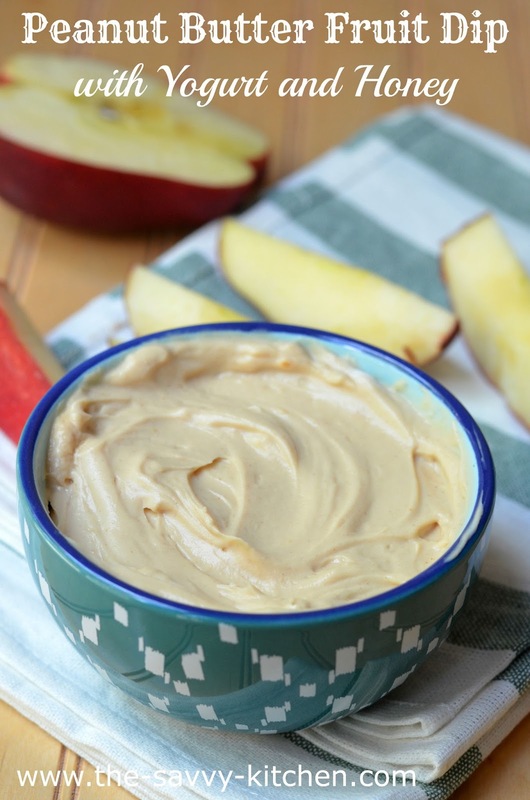 It's quick, healthy and super yummy. Enjoy! 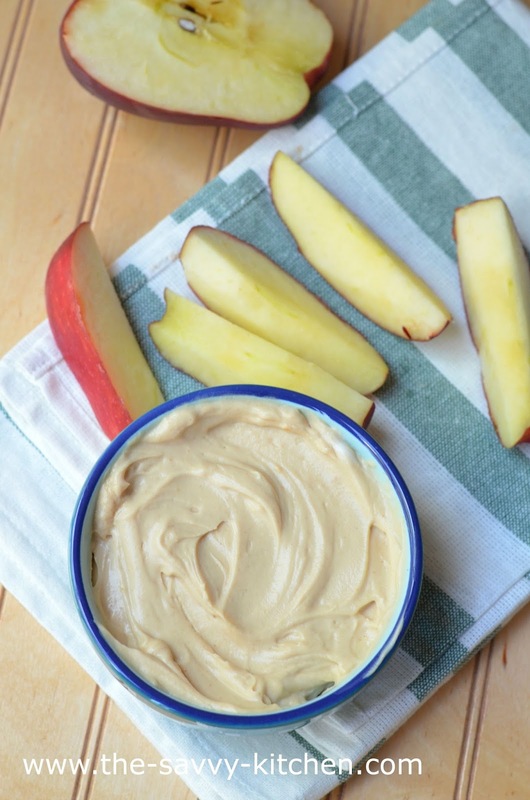 Combine yogurt, peanut butter and honey in a small bowl. Serve with fruit.